This is really a good time to buy used cymbals– thanks to the wonderful recession, and the proliferation of extremely high-end cymbals, prices for used merely-pro-quality cymbals are as low as they’ve ever been. Which is why it kills me to see young drummers spending hundreds of dollars on new student-line junk, which will sound like crap for the few years they will own them before finally sending them to the landfill. For about the same money they could have top of the line cymbals that will last a lifetime while sounding great and retain their value– most of it, anyway. So buy used. Really used. The best bargains are moderately old, very grungy pro cymbals– dirty, dull-looking bronze, painted-on logos only a memory– if they ever had them to begin with. You’re a musician and you play the things for the sound anyway, right? Then get over this consumeristic, virginity-fetishizing thing of needing to unbox perfectly pristine new cymbals– that only leads to buying crappy-but-shiny student cymbals when you’re poor, and spending way too much money on everything even if you’re not. OK, those aren’t actually cymbals. You might be able to use them as placeholders for cymbals until you can afford real ones, but consider their value to be basically zero– the money you spend on them basically goes away forever. I think it’s a big mistake to buy them new; buying them used you can and should drive and extremely hard bargain– I would never pay more than about $50 for a used semi-pro ride cymbal, for example. And do your homework so you know the difference between the almost-usable semi-pro cymbals and the true yellow-tinted sheet metal dreck. Generally, buying a cymbal without playing it first is an anathema to serious drummers, which tends to drive down used prices online. We’re going to take advantage of that. We’re also going to take advantage of the fact that you (or the person you’re shopping for) may be a little inexperienced, and won’t be real picky about your cymbals yet. But if you don’t like what you get, you can always sell them locally for what you paid for them, maybe a little more. My own experience with shopping this way has been that I’ve never gotten a true dog of a cymbal– most of them would work perfectly well for most drummers. Maybe some of the last half-dozen+ purchases I’ve made may actually have not been things I would’ve bought if I had played them first, but they have worked out very well for me in my actual playing. I’ve also passed along a lot of the things I’ve bought online that just didn’t work for me. Learn how to work the eBay. Most importantly, get acquainted with the “completed listings” search (do an advanced search, checking the appropriate box); this will show you how much things are actually selling for currently, as opposed to the asking, buy-it-now prices, which can be all over the map, and auction-in-progress prices, which can be absurdly low until the last moments of the auction. Note that some sellers refuse bids from people with no buying history, so if you’re just getting started with eBay, you should buy a number of smaller items, so sellers can see that you are going to actually pay for that $100+ item, and in a timely manner. Be familiar with the cymbal brands, lines and models. Right now the cheapest pro-quality cymbals appear to be 70’s and 80’s A. Zildjians and 80’s Sabian AAs. I’ve also been surprised to see a few very good deals on 70’s Paiste 2002s. It’s worth following some of Paiste’s discontinued pro lines from the 80’s and 90’s as well– the Sound Formula, 2000, 3000, and Dimensions series especially. Paiste’s old semi-pro 505 line is also quite good, and can be found very cheaply. You want to know the rough weight class behind the obscure, impressionistic labels companies slap on cymbals (“Stage”, “Power”, “Rock”, “Bright”, etc, etc). Getting a great deal only to have the cymbal arrive and turn out to be totally the wrong thing for what you wanted to use it for is the opposite of a bargain; that is, a costly problem. Even if it’s no big deal to re-sell the thing, it’s still a hassle and a time-waster, and you’re paying a little tax on the transaction to those twin vampire squid eBay and PayPal. And I just want to say, even if you’re a rock player, go to a local store and play a few “heavy”, “rock” or “power” labeled cymbals– and anything heavier than a medium-thin crash– before you start ordering them blind online. I’m just saying. Get lucky and hold out for the right price. Improve your chances of getting lucky by following a lot of auctions. I would consider the magic hold-out number to be around $100 (maybe $115 with shipping) for any cymbal larger than 18″, or for hihats. Maybe $60-80 for a 16″ crash. That’s very inexpensive, and you may have some difficulty closing an auction that cheaply, so you need to watch a lot of auctions for sometimes a period of weeks. Stick to your bottom line; there will be many more cymbals coming down the pike soon enough. As you look at price, don’t forget to factor in the cost of shipping. Learn how to work the Craigslist. This will be your means for reselling any cymbals that don’t work for you. It’s free, and people aren’t relying solely on a nice-looking ad to decide on a purchases– they can actually come over and play the cymbal. Since you held out for a great deal on eBay, you will have a lot of flexibility to give them a great deal and move them along quickly– you may even be able to turn a small profit, but don’t count on it. Just clean the cymbal up a little bit, take a decent picture. It’s not a bad place to shop, either– you can sometimes find bargains equivalent to what you can get on eBay, with the bonus of being able to play the cymbal before buying. A final word about damaged cymbals. 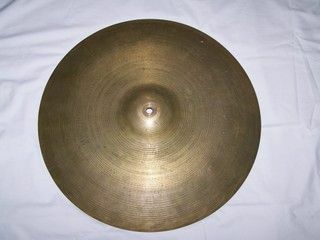 If you want really low prices, you can consider cymbals with very minor damage or wear to the metal– significant keyholing, slight edge funkiness (like a very shallow bend, or significant scuffs, “flea bites” or whatever), or slight cracks (meaning < 1/2″). These will lower the price of the cymbal without necessarily harming its playability; I’ve seen cracked cymbals played for years or decades without the condition or sound deteriorating further. But I don’t necessarily consider these to be a true bargain; you’re actually paying the real value of a damaged cymbal, and hoping to get lucky that the thing still sounds OK. Cracks are generally considered to be fatal sooner or later; not so much with the other damage I mentioned.